Soon you will be able to invest in a startup even if you're not rich. On Friday, the SEC finalized rules to give regular people the opportunity to make investments normally limited to big-money types. At the center of the change is the JOBS Act, which passed three and half years ago with bipartisan support in Congress. Much of the law has already been implemented. But the SEC voted 3-to-1 to open up so-called equity crowdfunding to a much wider group of people. Startups will now be able to raise up to $1 million a year via online platforms. Supporters of the JOBS Act say the change will level the playing field for investors, while also giving startups the ability to raise money from more people. Critics fear the requirements for startups seeking investment will be too demanding, or that unschooled investors could lose their money. 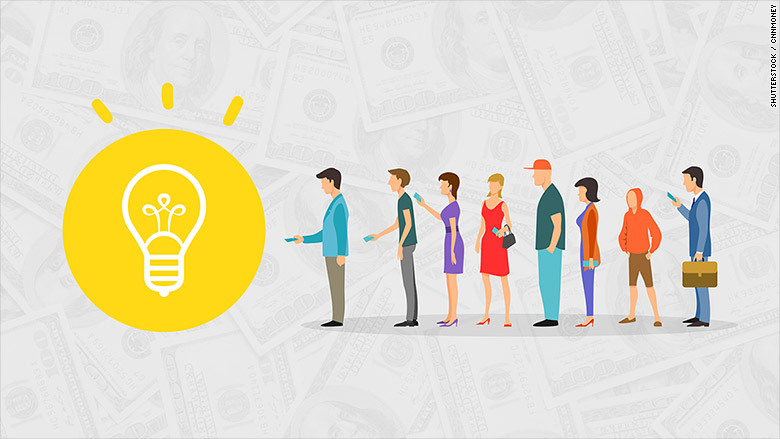 Startups have already been using equity crowdfunding companies like SeedInvest, Quire and CircleUp to raise capital -- but only from "accredited investors." Accredited investors are people with a net worth of $1 million, or who make $200,000 annually. Now unaccredited investors can invest but the SEC has put caps on how much to protect them from oversized losses. Erin Glenn, CEO of Quire, said that opening up investment in private companies will help diversify the types of companies that get funding. It will also help develop a more diverse group of investors. Just 8.2% of the people who make investment decisions at venture capital firms are women; 2% are black or Latino. The online portals like Quire will be required to do background checks on businesses that solicit funds on their platforms -- and can reject any that don't pass muster. For their part, startups will have to provide disclosures to the platform for investors to review. Portals like Quire will be allowed to take equity in companies using their platforms. SEC Commissioner Michael Piwowar, the sole dissenter, expressed concerns about the workability of the rules. He said they're full of "tricks" and spin a "complex web of provisions and requirements" that may hinder small businesses. But only businesses looking to raise $500,000 or more will be required to have financial statements reviewed by an auditor. Those raising between $100,000 and $500,000 must do outside financial review, but it doesn't have to be audited. And companies seeking less than $100,000 can submit their own statements. Commissioner Kara Stein noted that the SEC will conduct a three-year study to evaluate how crowdfunding develops. "Let's see how this experiment works," she said.